The deficit will not go away and should not go away! Must read interview with Jamie Galbraith. Government Shut Down for What? So it seems that Boehner is going to pull a Gingrich. Both the president and the House Republicans’ plans cuts are relatively minor. But the question is why cut spending now. The only reason spending cuts are necessary, if you agree that the crisis was caused by collapsing demand (not a supply shock) is because there is too much demand recovery. That would be signaled by full capacity, rising interest rates, and/or rising prices. In the first case, industrial capacity utilization was in January 2011 at around 76%, below the average for the 1972-2010 of close to 80%. In the case of interest rates, both short term and long-term rates are incredibly low. So if the economy is not at full capacity price pressures are not driven by demand. The US government can, contrary to you, borrow at low rates. The question is not so much if it should do it, but for what purpose. I would suggest that they give me more money, but I’m sure most people will be bitterly opposed! One image worth a thousand words, from the Congressional Budget Office, via Mark Thoma's Economist's view. ISLM: what is it good for? The ISLM model persists in most undergraduate textbooks, and even though it has vanished from graduate courses*, it remains central to the way economists think about policy issues. The main reason it survives is not so much that it allows a relatively simple intro to policy issues to undergrads, as some argue, but the fact that it captures the interaction between real and monetary phenomena which was central for Keynes’ General Theory (still worth reading), and is flexible enough to accommodate divergent views, often reflected in different inclinations of the curves. It is also true that the conventional interpretation of the ISLM is fraught with problems. But the ISLM model is incredibly flexible and can accommodate most critiques. For example, a few years back a reader asked Mankiw why he still taught that the Fed controls money supply, rather than control the rate of interest, which would be more relevant. His reply was not particularly good (just an ad for his book), but the fact remains that it is easy to change the LM to reflect the fact that central banks control the rate of interest. The ISLM with a horizontal LM is sometimes referred to as the ISMP, where MP stands for monetary policy rule, and for the most part this is done for the benefit of students (i.e. you can buy the new text with the updated ISMP model for $150!). The ISLM can also accommodate an investment function in which the level of activity, rather than the rate of interest, is central, which is more empirically accurate, and different consumption functions in which other elements besides disposable income appear. More importantly the ISLM does not imply a natural rate of unemployment, which often appears in the supply side part of the macro course. In other words, the ISLM allows for relevant discussion of policy issues, and clarification of policy differences. Besides, compare this model with the consumption theory you get in micro, and this is still one of the most relevant things you can learn in economics. The other would be not to trust economists! You should listen Diane Rehm's show today. Naked Keynesian Jamie Galbraith was there! Two economists at the Federal Reserve Bank of San Francisco (FRBSF) have written a paper in which they claim the natural rate of unemployment (i.e. the one consistent with price stability) is not around 5% anymore. Now it is close to 6.7%. It reminds me of a talk given by Solow at SCEPA in 2000, in which he said at the beginning that the natural rate did not exist, and by the end he suggested it was 5.2%. There are several ways of trying to measure the unobservable natural rate. One is to use the inverse relation between vacancies and unemployment (the so-called Beveridge Curve). The idea is that if there are more vacancies than regularly observed for a given level of unemployment, then the normal level of unemployment must be higher. Further, the idea is that job vacancies are completely driven by supply conditions (this is often omitted in explanations of the curve). If that is the case, supply changes drive the vacancies up, and the level of unemployment consistent with price stability adjusts upwards. So why did job vacancies went up? 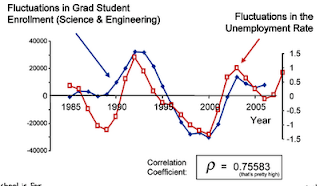 For one, mainstream economists (the ones that missed the bubble and the recession) argue that it is a mismatch between skills required by new technologies and workers capabilities. Also, it is argued that the extension of unemployment benefits discourages unemployed workers to look for jobs. The FRBSF economists argue that 50% of the increase in the natural rate is explained by unemployment insurance. And, at least, they note that the increase in actual unemployment is explained by a cyclical fall in demand. It is interesting to note that the natural rate changes with the actual rate of unemployment. A period with high levels of unemployment on average leads to economists' claims that the natural rate is higher. The Beveridge Curve is used to justify then the idea that it is the natural rate that drives the actual rate of unemployment. Of course it could be a simple case of reverse causality. Higher levels of unemployment on average imply that the normal (that somebody decided to call natural; Mr. Milton Friedman, by the way) would be higher. In other words, what drives the natural rate is the actual rate. Job vacancies can also go up as a result of higher levels of unemployment on average. For example, it has been reported that many recruiters do not want to hire unemployed workers. The workers may have the skills, but the perception is that if they are out of a job they must have done something wrong. 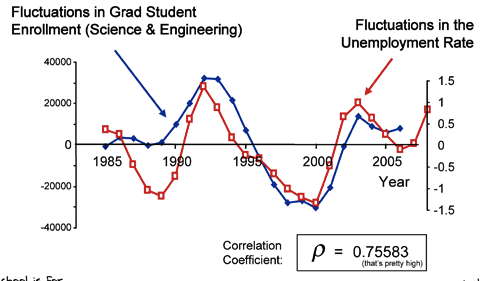 Logic suggests that it is unemployment that causes the increase in graduate student applications, but I would not be surprised if an economist claims it is the other way round. The point is simple. Perhaps one way of bringing down both the normal unemployment level, and the Beveridge Curve is to promote the creation of jobs now! So last year, during our ongoing battle on Keynesianism and common sense, a Fox News' bobblehead doll coined the term Naked Keynesianism. It was an attack on Jamie Galbraith's views on deficits and debt, and on the need for fiscal stimulus. The full video and commentary are here. So Jamie is corrupting our youth, and as far as I know I am too. You'll find here a few posts that should help those interested to understand why Naked Keynesianism is like Naked Logic. If you are against logic or facts, just go here.